All Clear is the second half of the novel Connie Willis began in Blackout. Despite being a fan of much of Willis' other work, I only stuck with this one because it won the 2010 Nebula Award for Best Novel, and I've made a project of reading all of them. As I stated in my review of Blackout, it was very disappointing. All Clear was somewhat better. With Blackout behind it, the conflict is set up, so the reader is much more engaged with the plot. (I'll describe the conflict in a relatively spoiler-free manner as, "Something is wrong with time travel.") Still, the plot feels like high-quality fabric stretched too far...like double-bed sheets on a king-size bed. Willis is not interested in a lot of technical mumbo-jumbo about how time travel works. That's fine, but under those circumstances, there's only so much interest I have in reading the characters speculate about how things work. The bottom line is that it works however Willis wants it to work, so let's get on with seeing what that is. I give this book 3 stars versus Blackout's 2 stars because it really comes together in the second half. I know you can't just cut out the first 3/4 of the Blackout/All Clear story and get something coherent, but I wish an editor had made her figure out a way to do it. It's touching, well-written and interesting -- everything I've come to expect from her other time-travel books. But I arrived there with a bad taste in my mouth of slogging through hundreds of pages of backstory. A shame. So now I've read all of the Nebula Best Novels from 1992-2010 (also 5 from the '80s, 6 from the '70s and 1 from the '60s). I've started Stations of the Tide, the 1991 winner. I probably won't continue in chronological order. I'm continuing on an e-book kick, but not all of the winners are available in that format. Also, the 1990 winner is Tehanu, the fourth Earthsea books, and I want to re-read the first 3 of those, but I'd rather check them out of the library and save a little money. We'll see when I get to that; I will probably pick an earlier winner instead. 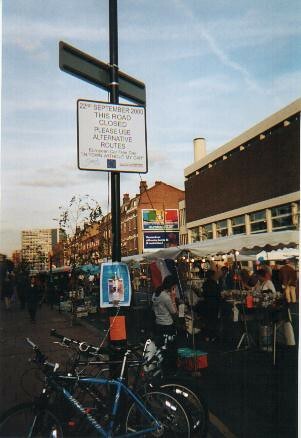 When I was in London on September 22, 2000, I came across road closures for something called "European Car-Free Day." As I was walking, the road closures didn't bother me, but I found the concept amusing enough to cause me to snap a picture. Fast-forward to 2011, and I was inspired enough by Car-Free Day to pledge to go car-free (or at least car-lite) on that day. Since I haven't gotten my bike together at the new house, and since rain was in the forecast, I decided to try taking the bus. According to Google Maps, I could walk for 0.9 miles, take the bus for 6 minutes, then walk for 1.3 miles. So I consulted the bus schedule and headed out so that I would arrive at the stop 5-10 minutes before the bus was scheduled to be there. 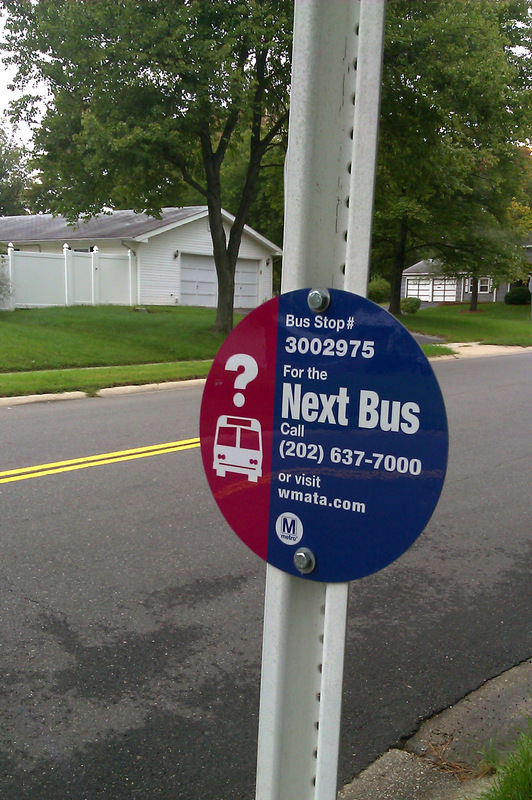 Metro has a feature called NextBus that allows riders to punch in the stop number and find out when the next bus will be arriving. I figured that would be good to know, so when I got to the stop, I punched in the number on my phone, and found out that the bus would be more than 45 minutes before it got there! At that point, it would be about the same amount of time to walk, so I hiked the 3.9 miles to work. There is one segment between the residential part of Bowie and the office park that lacks sidewalks and is fairly unpleasant (a part I'd need to walk even when taking the bus), but other than that (and the mugginess), it was a nice enough walk. It took a total of an hour and a half. On the return, I figured out how better to use NextBus. I consulted the site from my office computer and allowed a generous 40 minutes to leave the building and walk the 1.3 miles. So when I saw that a bus was 40 minutes away, I left my desk and headed out. Things went much more smoothly that way, although until the moment that the bus showed up, I was suspicious as to whether I would actually see it. There were probably around 15 people on the bus, so I was glad to see the route gets fairly heavy use. Only one other person got on the entire time I was on the bus -- I suspect almost everyone was coming from the New Carollton Metrorail station. What did I get out of it? I learned how to use Nextbus better. I learned I'd much rather ride my bike, even if there was going to be some rain. I learned that the bus is available as a backup, even here miles outside the Beltway. I learned I can walk more than 6 miles in a day, but it's nice to be able to soak in a tub at the end of it. And I learned that going car-free isn't just some crazy European idea. It's an Uno Chicago Grill. 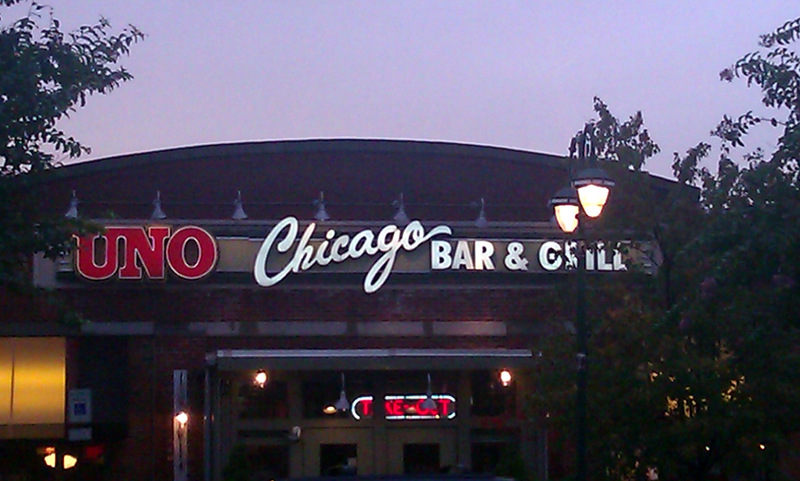 By which I mean Pizzeria Uno (the chain's former name). It's a Chicago-based deep-dish pizza restaurant from the 1940s which franchised heavily in the 1980s and 1990s, and then changed its name in an effort to sell people things other than pizza. I have somewhat of a soft spot for it because of the Ann Arbor location, which is located near campus, and which I visited fairly frequently twenty-some years ago. The fact that it's a convenient location for college-age kids to have a not-too-fancy, not-too-casual night out probably says something, but I'm not sure what. I had met Christina at this location before for lunch. The ten-minute guarantee on some of their lunches (including, I think, pizzas) is handy. Our most recent trip there, however, was in a much larger group. On short notice, I was putting together a Friday night dinner for nine adults and seven children (the oldest of whom is 3). I called a local, family-owned restaurant and had to convince the woman who answered the phone to be willing to take a Friday night reservation -- only to learn they only had two high chairs. 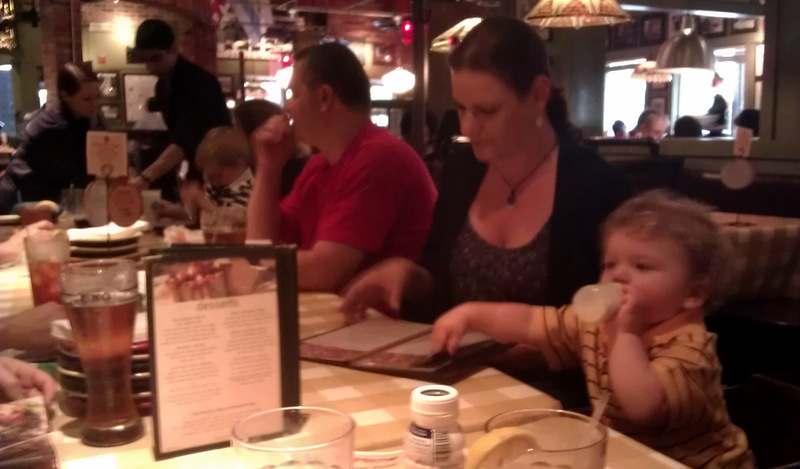 Uno's was happy to take the reservation -- although, as it turns out, they only had five high chairs. I managed to talk them into borrowing two from a nearby restaurant. All in all, they did very well with the gathering. I have a bias to believe that a local establishment has a natural advantage over a national chain, but here the chain acquitted itself very well. The back-to-school discount we got since one of our party was a teacher was a definite plus. The food was not as good as I remember it from college days. To preserve my memories, I'm going to decide it's due to a decline in the chain over the years, rather than the unrefined palate of college students. Nothing was bad, but nothing stood out as wonderful either. Still, it's a solid destination. The kid-friendliness earns them a total of 3 stars. By the way, I've changed the link at the top of the post to point to a more straightforward list of links to all the reviews, rather than a reverse-chronological set of blog entries. If you prefer the latter, you can always click on the tag "bowierestaurantproject" at the bottom of any of the posts. 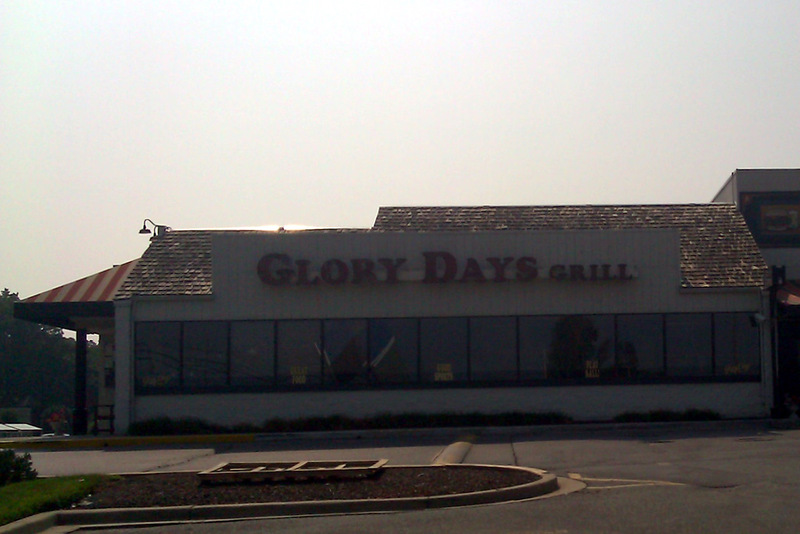 I had previously reduced the count of Bowie restaurants to 79. Investigation has determined that the KFC in Bowie Plaza has closed, so the number is down to 78. The three unlisted restaurants (two new, one mysteriously omitted) will be added either when the new guide comes out, or when I run through all listed restaurants. 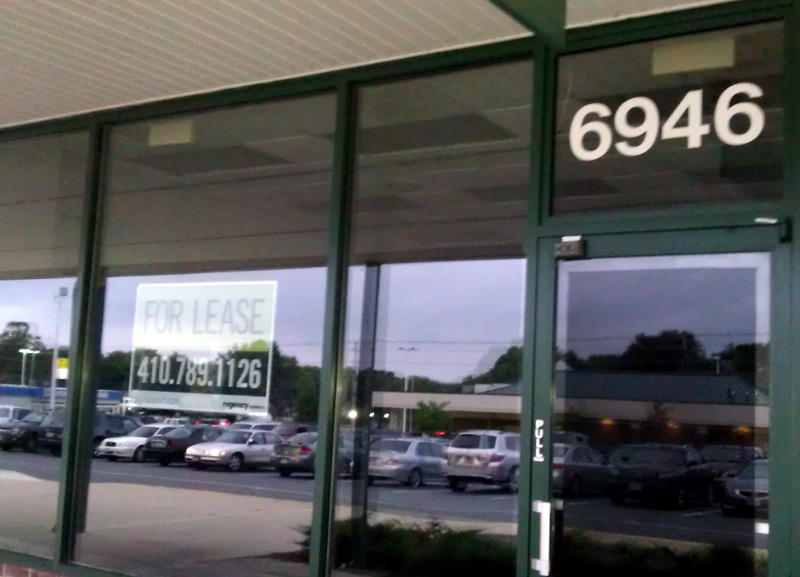 One of the 78 is the "Muffin Man Caribbean Cafe" in Hilltop Plaza, next to the Chesapeake Grille. The guide says it is "Opening 2010", but it has shown no signs of life. Now comes word that it's going to be opening in November (2011). I hope to review it soon afterwards. I've been to more World Heritage Sites in the UK than any other country. That's a reflection of the fact that I've been the UK more than any other country except the US, and there are a lot of sites in a relatively compact area in the UK. There are 28 in the UK, of which 22 are on the island of Great Britain. 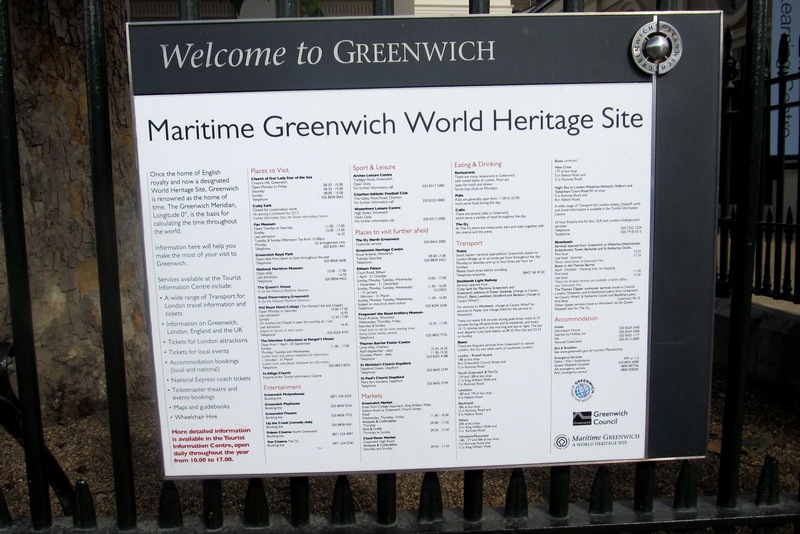 Four of those are even located in Greater London, but until this month I had missed out on one, Maritime Greenwich. With several hours between my arrival in Paddington Station and when I had to catch a train out of town, I decided to head in to see it. The Tube does not actually go to London, rather something called the "Docklands Light Railway" does. For a visitor, it's like the Tube, but with a different kind of train. Nevertheless, when I got to the transfer point at the Tower of London, I was overcome by a desire to approach Greenwich by boat, so I transferred to the Thames Clipper service instead. It cost me a bit of time, but it seemed appropriate. 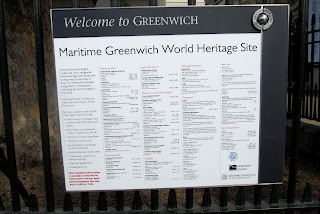 Once I got to Greenwich, I had time for essentially only one attraction before things closed and I needed to head back to catch my train. 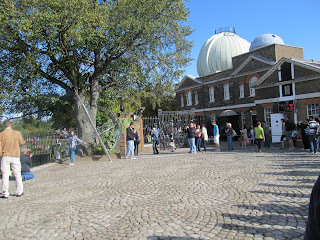 I chose the Royal Observatory, and it turned out to be an excellent choice. 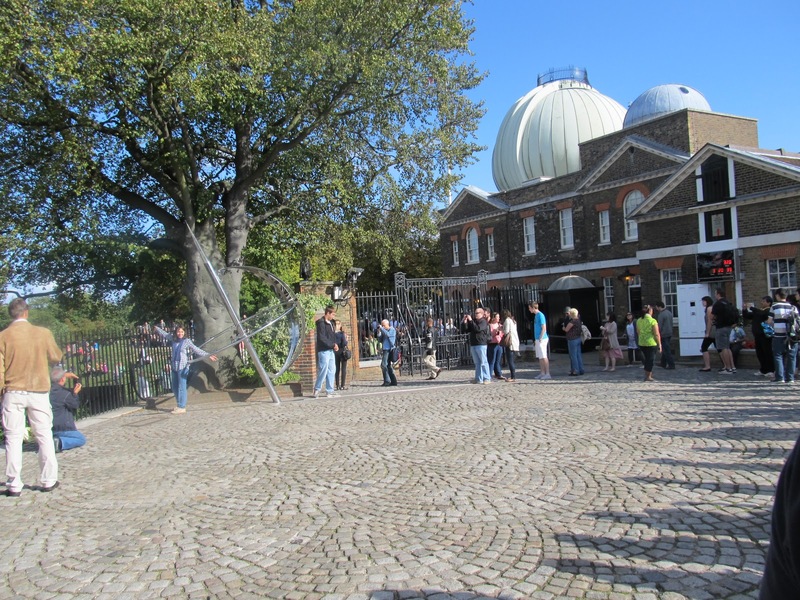 The Royal Observatory was founded in order to solve the problem of calculating longitude from a ship, and the Observatory now has an excellent exhibit with a very nice audio guide that tells the story. 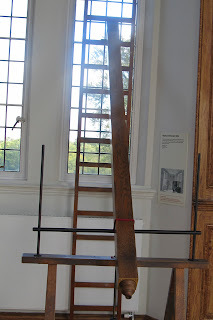 Despite the fact that the more obvious way to calculate longitude was to have accurate star charts (hence the founding of an observatory), the problem was also solved by John Harrison, a clockmaker who was able to build a more accurate chronometer than anyone had previously been able to carry on a ship. (Pendulums don't work too well at sea.) The story is fascinating, but I won't re-tell it here. (There's a book called Longitude: The True Story of a Lone Genius Who Solved the Greatest Scientific Problem of His Time from last year on the subject.) But it's pretty interesting to see how an observatory got to be the keeper of the world's standard time. So that's 50 World Heritage Sites I've visited (more than one-quarter in the UK! 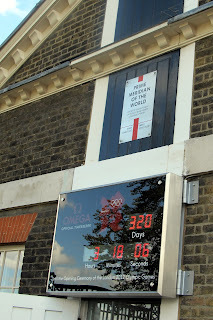 ), and the last one in London. I'm back up to 5.3%. There are only 3 sites in the southern part of Great Britain that I haven't visited -- Canterbury (a couple of hours from Cambridge, which I may visit next year), Dorset (a couple of hours from where I usually am in the UK), and Cornwall (the very southwestern tip of England). So I'm going to have to start diversifying. I have a chance to be near four sites in the first week in December, but even if I am, it would take a lot of doing to visit them all in what would be a very busy week. We'll see. It's a Taco Bell. It's a fairly unexceptional member of the species. It's like most other Taco Bells you have been to, except for the particularly scary ones. Based on how I've been rating fast food restaurants in this project, its rating is determined by the question: is it high-end fast food or not? To answer that question, we turn to a comment a friend of mine made when I became Foursquare mayor of a different Taco Bell, and I commented that I preferred to eat elsewhere, but lacked the time recently. Nobody WANTS to eat at Taco Bell--myself included. But when you need 4000 calories in under 4 minutes, for under $4, there are worse options! So, there you have it. 1 1/2 stars. I really like Connie Willis. When I heard her talk at the 2004 National Book Festival, she gave an impassioned speech about libraries. She encouraged the audience to check good books out of libraries, even if they weren't going to read them, so that the libraries would keep them around. She said when she asked her library why they had gotten rid of some classic books, they told her nobody had checked them out recently. She responded, "And now nobody ever will." So I really hate to give this book two stars. Blackout is the latest novel in her time travel series (well, the first half of her latest novel). Doomsday Book and To Say Nothing of the Dog previous won the Nebula award, and so did Blackout (along with All Clear, the second half of Blackout). Doomsday Book was a tense, enjoyable read (though not one of my favorites), and To Say Nothing of the Dog was a wonderful romp of a book. Blackout, on the other hand, is neither. I think of this book in three parts. The first, and shortest, goes back and forth between time traveling historians in World War II Britain and the same travelers in their home base of 2060 Oxford. So far, so good; this part is much like the other books. There is some hint that something may be wrong with the time travel mechanisms, and some interesting interpersonal interactions. The second part of the book consists of the time travelers interacting with the WWII "contemps" (locals). At this point, the book seems to be over-researched. With any period piece, that is danger, but with time travel this tendency becomes worse -- the time-traveling historians know the background behind every event, and often stop to muse on it. Furthermore, it's unclear where the dramatic tension is supposed to be coming from. We already know how the war turned out, and there's scant connection with the stories of 2060 Oxford. What we get instead are slices of life from 1940 (mostly) Britain. The third part of the book picks up again, as three of the time travelers' stories converge, and there begins to be the hint that whatever is messed up with time travel is going to cause them problems. 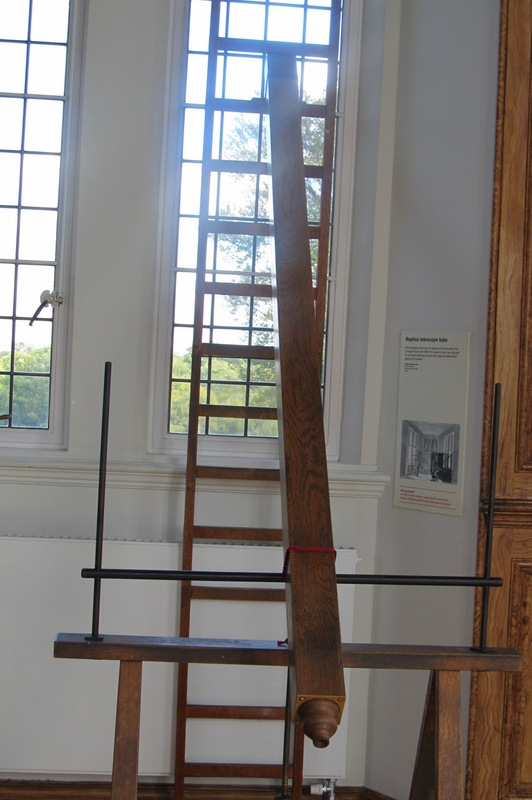 But it remains a hint, and there's a lot of maddeningly vague wondering, "Did we change history?" from characters who can't quite match up what they're observing with their memories of what was supposed to happen. In other words, the book moves way too slowly. I still have high hopes for All Clear, and I'm going to read it -- if for no other reason, it won the Nebula, and that leaves to me to wonder, why? My best guess is that, well, everyone likes Connie Willis. My excuse for doing the Nebula novel reading project rather than the Hugo novel reading project is that the Nebulas are chosen by authors, and the Hugos by the fans. The authors, presumably, would have more refined tastes. On the other hand, they know Willis, so they may be biased by how likeable she is. Of course, Blackout/All Clear won the Hugo, too, but I'm guessing many fans like her too -- though the reviews on Amazon haven't been as kind as I might have expected. One final note. I finished off this book while traveling around London. It was pretty neat to read about Underground lines as I was traveling past them, and see ads for department stores that appeared in the book. A good reminder that only 70 years separate this island from memories of aerial bombings and a strong fear of invasion. It's been almost five years since I've blogged about go, and even longer since I've written about my online rating. Going to go tournaments or go club was a major investment of time, and I found that I would rather spend my game-playing time with friends. Of course, with toddlers, I have no time for competitive in-person go, though in a few years, I hope I can teach them and start taking them to compete against their elders. I have, however, recently started playing online again, after Ben gained a renewed interest in it. Despite the fact that I don't have time to study my go books, or even devote that much thought to it, my rating is now 15 kyu, higher than it ever was before I took a break from playing. It even got to 14 kyu at one point, but it's been bouncing around as it tends to do. 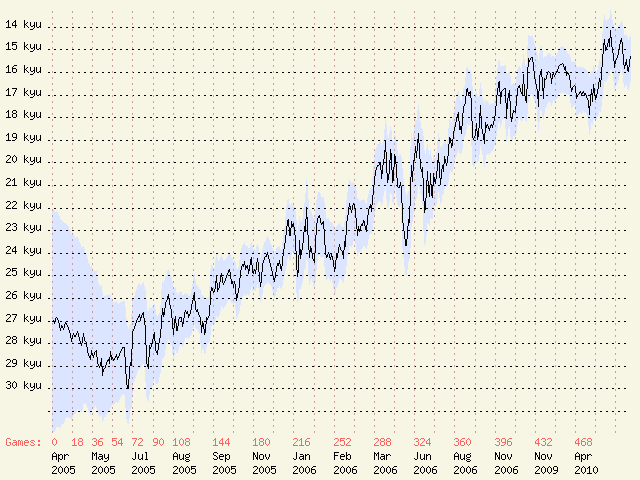 The go server that I use now allows you to plot your rating versus number of games played, rather than just time. 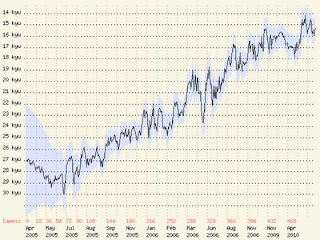 That graph for my account is reproduced above. Though there's a fair amount of volatility (including a significant dip when I took up the game again in late 2009), the pattern is clear -- in fact, almost linear. So what's the secret of getting better at go? Play more games! I don't claim that's an original observation; I think there have even been studies to that effect. But I find it interesting that it continues to hold even in the mid-teen kyu range I have now achieved. I had suspected my go abilities had plateaued (and was just happy to steal time for a move here and there). Since I don't have time to play as much as I used to, my rating will improve more slowly, but it would be really cool to achieve single-digit kyu status some day. 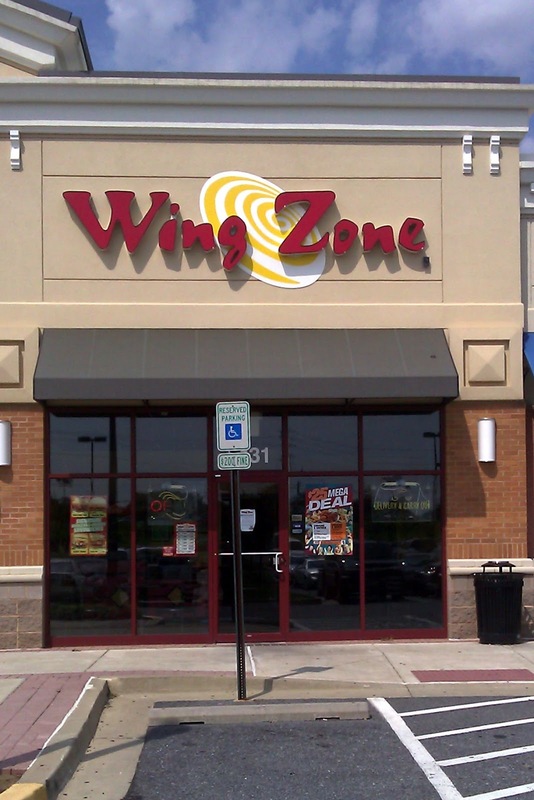 I don't think Wing Zone -- with about 100 locations -- is ubiquitous enough for me to say, "It's a Wing Zone," and have that mean much to many people. 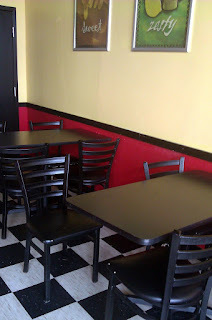 Wing Zone -- or "The Wing Zone"? -- is a chain of wing restaurants that primarily serve the takeout and delivery markets. There are four tables at this Wing Zone, so it technically meets my "restaurant" criteria, but barely. When I went there, the guy bagged my food for takeout without even asking me if I wanted to eat there. That experience also revealed the disappointing lack of celery as a standard option. You get a pack of blue cheese or ranch sauce, but you have to pay extra for celery. Ordinarily, I'd want to make more than one visit to judge a place that isn't just another location of a chain I'd been to before. But, since they deliver, and we're still unpacking our kitchen items, it seemed that delivery could give another way of rating Wing Zone. The delivery itself was fine; I was able to schedule it online. I got wings, which were once again pretty good -- comparable to something like Buffalo Wild Wings. 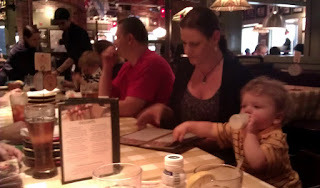 Christina got a burger, which was flavorless and overcooked. We also ordered some brownie bites, which turned out to be fried, like almost everything else they serve (pickles, mushrooms, etc.) The one non-fried-item we could find was a grilled chicken sandwich, which we ordered for the boys. (We cut up the chicken and threw away the bun.) It was actually pretty good, but in the future I think we'll just cook up chicken here and save some money. Wing Zone offers some variety to the Bowie dining scene, but not exceptional food and the dine-in option is kind of sad. As a chain, it would top out at 4 stars (barring exceptional circumstances), but it doesn't really come close to it. Still, it's not fast food, and it's worthwhile to have. If you want wings, they're probably the first call you want to make in Bowie. 2 1/2 stars. In other Bowie restaurant news, the Uptown Cafe has opened at 16701 Melford Blvd., in the Maryland Science and Technology Center. It's basically a breakfast/lunch deli for workers in the office park. Although it doesn't rate too highly on the excitement meter, it has the potential to fill a pressing need -- a place to grab lunch quick without having to go out onto the highway. Hopefully it will suffer a better fate than Pep Stars Cafe, the previous tenant, which moved out to Fairwood (a development just west of city limits). As with "Bang Bang Mongolian Grill", I'm going to delay review until it appears in the new restaurant guide (or I run out of restaurants in the current guide). Also on my radar is Ravza, a Mediterranean restaurant near Wal-Mart. 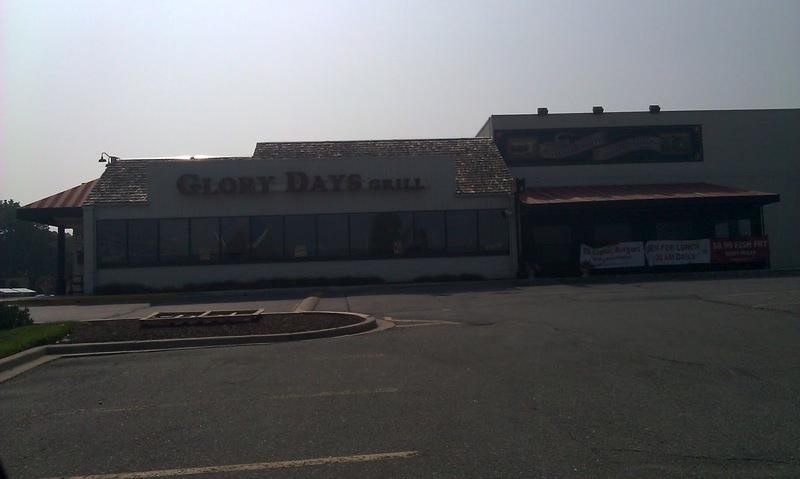 I don't know why it didn't make the city's restaurant guide, but it does appear to be both a restaurant and in Bowie. Again, I'll wait and see if it appears in the new guide. 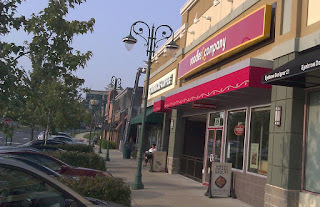 It's a Noodles & Company. It's a chain of stores that pulled off the clever trick of getting you to pay restaurant prices for the one type of food -- pasta -- that almost anyone can make at home. Fortunately, it does it well, so if you don't feel like whipping up some mushroom stroganoff in your kitchen, or you're looking for mac & cheese that is a cut above the kind that comes in a box, this is your go-to place. I think it gets 2 1/2 stars based on comparison to Five Guys, which also got pegged at that rating. It's a chain that's a cut above fast food. We used to visit the College Park location all the time. The Bowie one is newer, and the facilities look a little bit nicer, but otherwise there's little difference other than a wider age range in the clientele. Like Five Guys, Noodles & Company is located in the Bowie Town Center mall. I was considering docking it points for the annoying distance I had to walk from the car. Then I timed it at two minutes and felt lazy. Then I realized that the problem is not the distance, but the layout of the mall. The Bowie Town Center mall was originally approved in the 1970s as an indoor mall. Twenty years later, when the project started to move forward, indoor malls were out of fashion. To go along with the "town center" concept, the developers included parking in front of the stores -- but not enough parking for most of the customers, just enough to give a "main street feel." The problem is that most people park farther away, and then have to intersect with the cars looking for close-in parking. I had to cross three "streets" on my 2-minute walk. In retrospect, I could have cut that to two, but I would have had to cross an additional crosswalk in my car to get there. So, no demerits to Noodles & Company for the parking, but a continued beef with the mall for having a dumb layout. I was going to post my review of A Dance with Dragons, but it seems to me that it's not that interesting. As I say in the review, "If you've read the first four, there's very little I could say to affect your decision to continue with this one, and if you haven't, you should start with the first and see how you like it." If you're still interested, you can go to Goodreads to see my review. Instead, I'm more interested in writing about how I read the book. Despite not owning a Kindle, I bought the Kindle version of the book from Amazon. Why? Well, I could read it on my computer, Christina's iPad, or my phone. How did it work out? Surprisingly well. First of all, I didn't have to lug around, or keep track of, a hardback book. If one of those pieces of electronics is available (pretty much any time I'm not at work), I can read the book. Even though I know the software behind the synchronization is trivial, I still ended up feeling impressed when it would remember my place even when I switched devices. I would read on the iPad before bed, the PC when I was up late, and the phone whenever I found a few spare moments when I was out and about. I decided not to read when I only had a minute or two -- say, in a checkout line. I didn't think the book would be well served by that kind of choppiness. But if I had enough time where I expected that I could get through a chapter -- say, walking to lunch, I eagerly dug in, especially when the plot started moving fast enough for me to be eager to find out what happened next. I've seen various complaints about what the decline in printed books could mean. But after considering most of them, I'm OK with it. I don't have an attraction to the paper and ink -- if anything, an e-book feels like a purer connection with the author's words -- the things I read a book to experience. I don't mind not having a book to put on a shelf when I'm done. I have too many things around my house, and I've taken to selling used books for whatever pittance a secondhand bookstore will take. And since I tend to treat books as one-time experiences -- like a movie -- I am also not concerned about proprietary formats for e-books. As long as the format is supported by wherever I want to read it in the next month or so, I'm OK.
Actually, to solve the clutter problem, I had been reading a lot of books from the library. That also cut down on expenses. With kids, however, I don't always have time to read a book before it's due, and I don't always want to make time to return it when it is due. E-books are more expensive (than free), but I think the convenience makes it worth the expense. That's particularly true since I don't have as much time to read as I used to. I had been looking forward to A Dance with Dragons for years, but it still took me a month and a half to read. My expenses aren't going to go up that much -- as long as I only by e-books I am certain to want to finish. For new authors I'm giving a try-out to, I'll probably stick with the library. I think what really sold me on the idea of e-books is traveling. In the past, I had to decide how many books to stuff in my suitcase at the expense of clothing and other items. I think I've had about an equal number of trips where I lug around a couple of books I never open and ones where I run through all of the ones I brought and wish I brought more. So I've gone ahead and bought Blackout (the first half of the most recent Nebula novel winner) as an e-book. It's not as good as A Dance with Dragons, but I know I'll finish it as part of my Nebula project. I see a lot of e-books in my future. 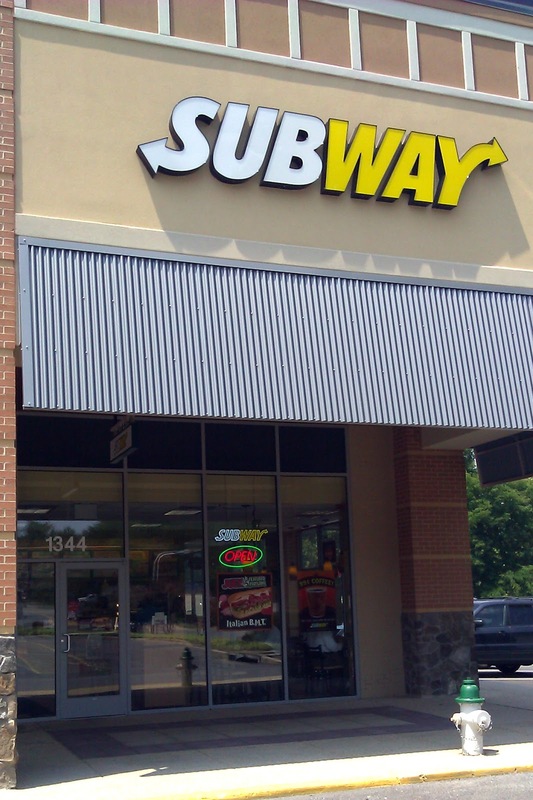 At least it's not another Subway. I had started to prepare a post tying Quiznos' severe financial difficulties to their decision to get rid of the Honey Bourbon Chicken, my favorite sandwich. A little bit of Internet research, however, indicated the continued presence of the Honey Bourbon Chicken sandwich on their menu, which did not square with my recent experiences. So another in-person visit seemed to be called for. Although the Bowie location does not offer on-line ordering, the Quiznos site helpfully provided a phone number for me to call in the order. This seemed great -- if they denied the existence of the sub, I could write my review based on my previous visits and the absence of the HBC. But as it turned out, the HBC is still there -- or perhaps it has returned; that will remain a mystery. Ultimately, what Quiznos is about is the opportunity to have a notch-above-fast-food experience. 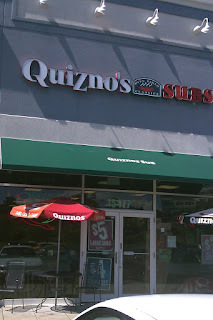 Because it's the only Quiznos, and it provides a respite from the sea of Subways in Bowie, I'll keep it at 2 stars. The location itself is kind of awkward. It's in the Bowie Town Center mall complex, but not really in the mall part. It's sort of near the Safeway, but not right next to it. It's as if someone decided to shoehorn a strip mall inside the mall. It's not a big deal, but as a newly-minted Bowieite (Bowiean? ), I am disappointed in the poor layout -- if also you go almost anywhere else in the mall, you're going to get into your car.